" '2001.' I see it every week." -- John Lennon. Finally, the curtain falls on the old millennium and rises on the new. If you thought you were celebrating the dawn of the 21st century last year, you should be ashamed of yourself. It sounds strange to say it: "January 1, 2001." It's only days away, and yet still it sounds like the far future, just like it did when I was a boy, when "Star Wars" was new and "Star Trek" was in reruns. It doesn't help that a film more futuristic than the reality we've created for ourselves shaped our collective vision of 2001. What? You thought I was going to let this moment in time pass without mentioning "2001: A Space Odyssey?" What kind of science-fiction columnist would I be if I did that? Anyone with even the slightest interest in space exploration must feel a twinge of disappointment, knowing we'll greet the new millennium without Pan Am flights to orbiting hotels, spacecraft capable of manned flights to Jupiter and artificially intelligent computers. At the same time, director Stanley Kubrick and writer Arthur C. Clarke didn't foresee the revolution in personal computers and hand-held technology. If they were making "2001: A Space Odyssey" today, Dr. Heywood Floyd wouldn't telephone his daughter from a huge videophone booth. He'd call her on a wireless phone not unlike the ones we now take for granted. In countless small, mundane ways, our present is more advanced than the future Clarke and Kubrick imagined, even if we don't have a HAL 9000 to read our lips. But "2001: A Space Odyssey" hasn't withstood the years because of its predictions. It has lasted because of what it says about us as human beings and the understated, mysterious way in which it says it. "Why do we go back to see '2001' over and over?" asks Ray Bradbury. "Surely not for its one-track acting and baffling finale. We return to it because the very possibility of its interpretations frees us to carom off into the greatest of all architecture: the universe itself." Certainly Clarke kept on caroming, writing one good sequel, "2010: Odyssey Two," which became a not-bad movie, and two terrible ones, "2061: Odyssey Three" and "3001: The Final Odyssey," which fortunately remain unfilmed. Someone else who caromed off of "2001" was Jack Kirby. 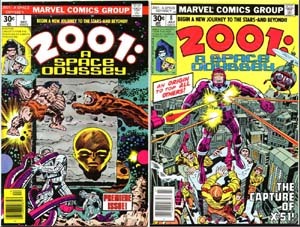 Marvel Comics published a comic-book version of "2001: A Space Odyssey" that lasted 10 issues. Jack Kirby wrote and drew the series, which featured the first appearance of Machine Man in issue No. 8. Kirby, probably the greatest and most influential comic-book creator of the Silver Age of comics (1956-1969), wrote and illustrated all 10 issues of Marvel Comics' "2001: A Space Odyssey" series, published in 1976 and 1977, nearly a decade after the film's 1968 theatrical release. Rather than try to continue the story of the movie, Kirby decided to play with some of its themes. Again and again, new astronauts encounter the otherworldly monolith, which then evolves them into higher life forms. Kirby also created his own humanoid counterpart to HAL. If Kirby's "2001" is remembered for anything, it is for the introduction of Machine Man (although he isn't called that) in the series' eighth issue. Machine Man still appears occasionally in Marvel comic books. "2001" came along shortly after Kirby entered his "cosmic phase," and it certainly reflects it. In 1970, for DC Comics, Kirby began working on the characters with whom he is most associated, the New Gods. The psychedelic style Kirby developed while working on books like "Mister Miracle" and "Forever People" suited "2001", as anyone who has seen the movie's ending is sure to agree. Kirby and Kubrick, each a pioneer in his field, complemented each other perfectly. "2001" has even influenced movie stars. The just-released inaugural issue of Space.com Illustrated magazine features an interview with actor and space enthusiast Tom Hanks ("Apollo 13"), who figures he has seen "2001" at least 41 times. "It's totally influenced me as an artist," Hanks says, "because I keep trying to emulate its ability to communicate something without the obvious verbiage. I look for those moments where a relationship between two people is communicated and they're not speaking to each other, like Bowman and Poole." Nearly everyone today who gazes longingly at the stars or simply wonders if his or her personal computer is out to kill them is caroming off "2001" in some way, and that's the true test of the movie's worth. As with all successful science fiction, its value isn't found in how it predicted the future, but in how it helped shape it.